Harpeth River, Narrows of the Harpeth State Park, Kingston Springs, Tennessee. April 20, 2014. My daughter, Kelly, and her husband, Chuck, have an Easter tradition of a picnic lunch. This year Betsy and I drove to their home in Ashland City where we were able to join them for a very enjoyable day. 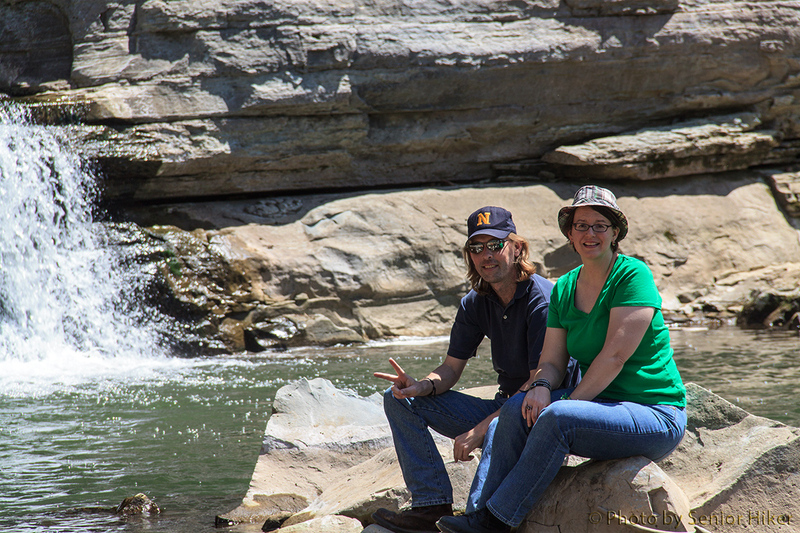 After an enjoyable lunch at one of the Metroparks, Kelly and Chuck took us to Narrows of the Harpeth State Park. Betsy and I had never been there, so it was a wonderful treat. 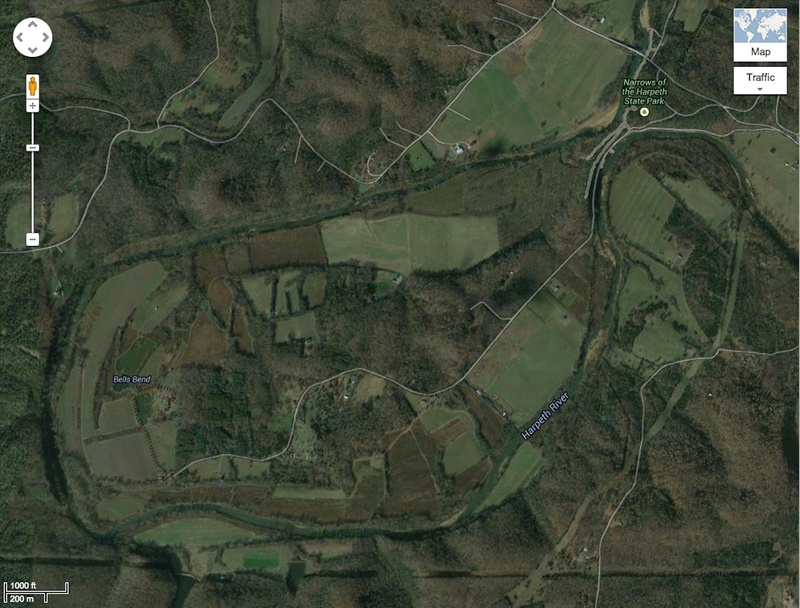 Map of Bells Bend and Narrows of the Harpeth. (Image from Google Maps). 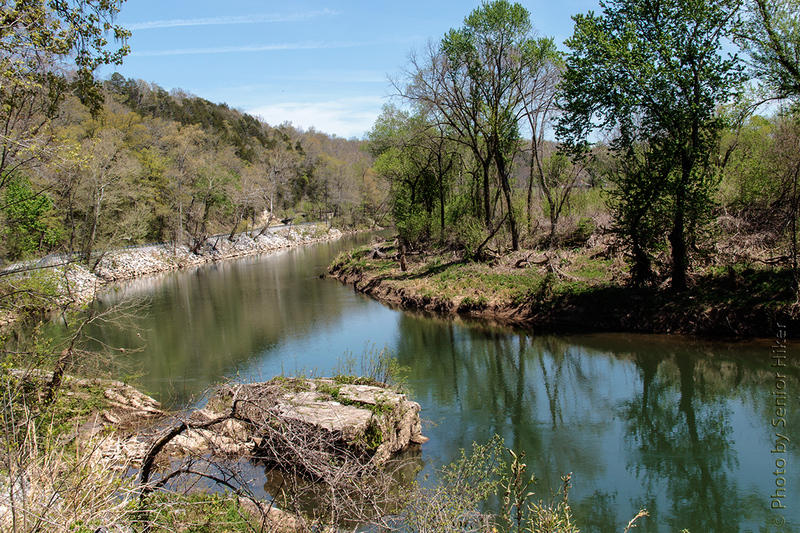 Narrows of the Harpeth gets its name from the fact that the beginning and end of a seven-mile loop of the river around Bells Bend are within a couple of hundred feet of each other, separated by a high bluff. 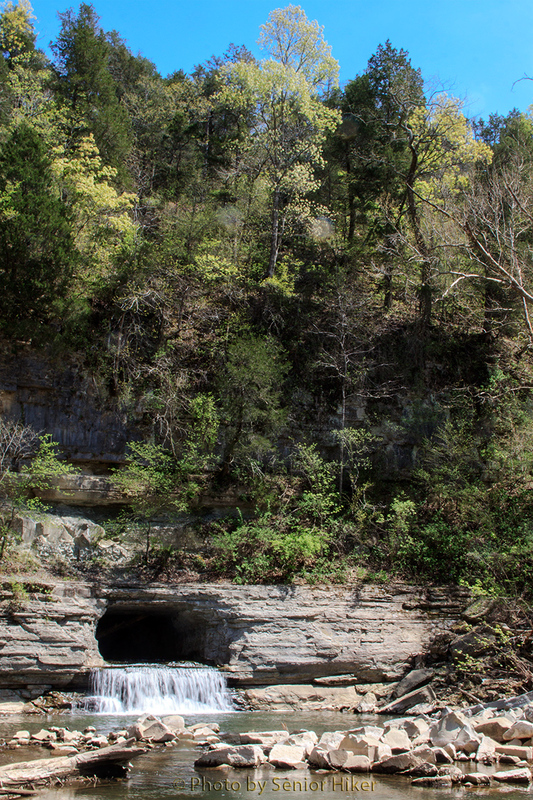 In 1818 Montgomery Bell, a businessman, cut a tunnel through the bluff that separates the two sides of the Narrows of the Harpeth. This tunnel allowed him to create enough moving water to power a forge which he established on the site. Kelly and Chuck at the pool where the tunnel empties on the downriver side of the narrows. Narrows of the Harpeth State Park, Kingston Springs, Tennessee. April 20, 2014. The four of us hiked to the downriver side of the tunnel. There is nothing left of the forge, but a pool into which the water from the tunnel empties provided a wonderful place to sit and enjoy a beautiful day. This entry was posted on May 5, 2014 at 3:36 am and is filed under Our World. You can follow any responses to this entry through the RSS 2.0 feed. You can leave a response, or trackback from your own site. George, what a neat park..The water coming out of the tunnel is a pretty scene.. Great post. Have a happy week! Beautiful! What did he use the forge for? Even man-made, waterfalls are so inspiring! Nice photos, too, of Kelly and Chuck! I just hiked that yesterday for the first time and wrote a post about it. Very cool place to go. What a beautiful place and such wonderful captures for the day, George!! Thanks as always for sharing the beauty of your world!! Have a great week! What a fun day we had!!!!! That’s one place I’d love to go back to sometime!!!!! Great photos —and great memories.. I have never heard of such a thing, but it would have been a fascinating thing to see! The river looks so calm! so many beautiful parks in this country. you are showing us so many of them. glad you had a wonderful day with family. I love your photos and the google map…What a fun spot! What a great day! Lovely shots. Beautiful scenery.I am sure this day was special in every way. Beautiful scenic place. Goods to see having good time with family. What a lovely, scenic park! I am happy that you and Betsy were able to enjoy Easter with family! Wow, that fellow went to an awful lot of trouble to power a forge! I’d love to visit that place…it is nice that you got to get together with family there. “Senior Moments” has been included in Sites To See #368. Be assured that I hope this helps to point many new visitors in your direction. In 1818, that was a major feat of tunnelling!! !What a strange way for the river to flow! Glad you had a good day! What stunning captures of nature’s beauty. It reminds me a bit of the Caney Fork River, at certain points. Wonderful place for a visit.